Thoracic fusion surgery would be the nuclear option — my spine wasn’t unstable despite the fact that one bone fragment protruded posteriorly toward the spinal cord, and I wasn’t the least bit interested in having metal rods inserted in my back, so we ruled that out quickly. Conservative treatment? I really didn’t want to spend 6-8 weeks at home in a back brace. 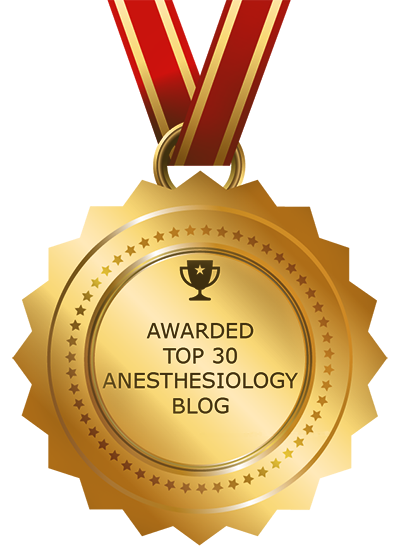 Two of the partners in my anesthesiology practice, who had come to see me in the ER, collared the neurosurgeon in the hall and explained to him that there was no way I would be patient enough or compliant enough to put up with 6-8 weeks of idleness. Dr. Siddique agreed that early kyphoplasty was probably what he would choose in my situation. It offered the best chance of quick pain relief and early return to work. It also offered the immediate hope of restoring height to the collapsed vertebra, and reducing the risk that I would end up with permanent spine curvature — the “dowager’s hump“. So I was admitted to the hospital to rest for the night, with a plan for kyphoplasty the next morning. This is a minimally invasive procedure, performed under local anesthesia with sedation. At my hospital, kyphoplasty is performed by a radiologist in the interventional radiology suite, though it may also be done by a neurosurgeon in the operating room. Two large-bore needles or “trocars” are inserted into the fractured vertebra, and small balloons are inserted via the trocars. The balloons are inflated to create a space inside the vertebra and restore the height that was lost in the vertebral collapse. The balloons are withdrawn, and then a type of cement is injected to fill up the new space. The trocars are removed and the cement hardens quickly. The entire procedure takes about half an hour. 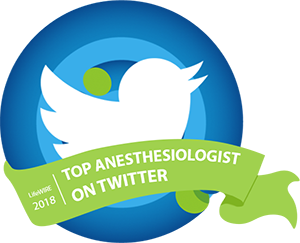 Thanks to the sedation, administered and carefully monitored by a physician anesthesiologist who’s another one of my partners, I dozed from start to finish. Armed with a new Jewett back brace and a bottle of pain medication (Norco), I went home the same day. In retrospect, being in the hospital was the easy part. I’m certain that the pain has been considerably less than it would have been without the kyphoplasty procedure to stabilize the bone, but the recovery has turned out to be more challenging than I expected. The normal response to a back injury is for the muscles on either side of the spine to tighten up and go into spasm. This reflex helps stabilize the spine and avoid further injury. But those back spasms don’t go away instantly, and they’re much more uncomfortable than I would have imagined. There are huge risks to taking a lot of narcotics — it’s easy to escalate their use and become addicted. All narcotics are chemical derivatives of opium, and are often termed “opioids”. These include standard pain medications like morphine, Demerol, Dilaudid, Norco, Vicodin, and Oxycontin. Once a patient gets used to taking large doses, the body becomes physically dependent and the habit is brutally hard to break. There are minor side effects too — drowiness, constipation, and nausea, among others. I hated how groggy Norco made me feel, and preferred non-steroidal anti-inflammatory medications (NSAIDs) such as Aleve or Motrin. But I soon learned that NSAIDS weren’t a good option right after a fracture, as they slow down the normal process of bone healing. I developed my own daily routine over the next week. Tylenol worked fine (though not as effective as Norco), and a prescription medication called Robaxin (methacarbamol) helped with the muscle spasms. I alternated mile-long walks with Milo, my dog — the only exercise allowed — with resting on the sofa with a heating pad. After a week at home, I went for a consultation with a specialist in osteoporosis, Dr. Stuart Silverman. He repeated a bone density scan and confirmed what I already suspected to be true. My previous diagnosis of “osteopenia”, or reduced bone mass, had escalated to full-blown osteoporosis in my spine. On that morning in the gym, my T12 vertebra just couldn’t handle the weight and suddenly collapsed. This could happen at any moment — sometimes just a vigorous sneeze can cause a vertebral fracture, or it could easily have happened the next time I picked up one of my grandsons. Dr. Silverman pointed out one important fact about kyphoplasty. 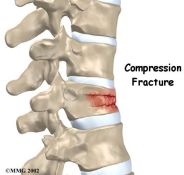 It may increase the risk of fracture in the vertebrae above and below the fracture. Think of a basket of eggs, and imagine that just one of the eggs is filled with hard cement. If the cement-filled egg bumps into another egg, that egg is much more likely to break. That image is a vivid reminder to move smoothly, use good body mechanics, and not lift any object heavier than a cat. There are several choices of medications to treat osteoporosis. They fall into two types: antiresorptive medications that slow bone loss, and anabolic drugs that increase the rate of bone formation. The National Osteoporosis Foundation is an excellent resource for facts about osteoporosis and information about the different drugs available. Any decision about treatment of osteoporosis involves a full discussion with your physician of the risks and benefits of medication in your particular situation. I’ve started on the medication that Dr. Silverman and I decided is the best choice in the setting of an acute fracture. Other than the occasional twinge of muscle pain, I’m fine and ready to go back to work tomorrow. I feel very fortunate that kyphoplasty was immediately available, and that my osteoporosis has been diagnosed and treated sooner rather than later. Acute pain can be treated thoughtfully with selective opioids as well as non-opioid pain medications — an approach known as “multimodal analgesia”. Acute pain doesn’t need to turn into chronic pain. That’s a message we hope everyone hears during #PainAwarenessMonth. So you obviously took good care of yourself before this incident. You even mentioned taking Calcium and Vitamin D as many of us do. So this happened anyway. What good is the Ca and vit D if it doesn’t prevent the osteoporosis? That’s an excellent question! I don’t know if the osteoporosis would have been worse, earlier, if I hadn’t taken calcium and Vitamin D all along. Not my area of expertise. But Vitamin D deficiency seems to be associated with other problems, including earlier cognitive decline, so I’m not inclined to stop taking it! I am very glad you were able to have vertebral augmentation in a timely fashion. As a provider of this procedure, I am constantly frustrated in getting the procedure approved. the only way to get this procedure promptly with novitas making the rules is to be made an inpatient. Patients have to fail conservative therapy for 4 weeks before Medicare will cover. They also will not cover without a diagnosis of osteoporosis. So the insurance companies have followed suit and will not cover younger patients who could get over the fracture faster and back to work. That is so true! The patient’s only hope of prompt treatment is to go to the emergency room. That enables all the imaging (CT scan, etc.) to be done without prior authorization. Then the patient needs to be admitted under the rationale of intractable pain. Luckily, the physicians looking after me understood this very well, and did what needed to be done to arrange kyphoplasty the next morning. My injury was two weeks ago today. I am back at work and close to pain free. Surely there’s more benefit to society from that outcome than from weeks of pain and inactivity, muscle loss, productivity loss, and the threat of developing a chronic pain syndrome. Only one type of osteoporosis medication is approved for use after an acute fracture, and that is teriparatide. Generally this is NOT a first-line treatment; others like the biphosphonates are the more usual drugs for initiation of treatment. Again, all these medications have risks and benefits. No one should start on any of them without a bone density study and a full discussion with your physician. I am sorry to hear of your fracture. Being a clinician myself, it hard to have patience with the healing process. I also have osteoporosis and brittle bones… this is a result of in utero exposure to the drug DES (Diethylstilbestrol) Researchers have now found that the skeletal structure was also affected! Even more valuable info and an outcome to hope for. Luckily I skipped over here after commenting on Kevin, MD. I salute your stand on need to avoid chronic pain and inactivity before treatment! I read with interest your story as in some ways it is so similar to mine, yet so very dissimilar. I, too, am an Anesthesiologist, with osteoporosis and osteopenia who sustained L1 and L2 compression fractures. This was in November of 2014. I was only offered conservative care (back brace, narcotics and anti-emetics) with a follow-up scheduled 6 weeks later. I was not on the ball self advocating as I had also sustained a concussion which went undiagnosed for 3 weeks (I thought the blurred vision, headaches, slow thinking, hypertension and vomiting were because of the narcotics. My 2 level kyphoplasty followed almost 4 weeks after the initial injury, thanks to my brilliant Internist’s quick referral. As it turned out, my L2 was not healing. It was fluid filled and destined to completely collapse when I resumed “normal” activities without my brace. My question for you actually is work related: How do you manage to work as an anesthesiologist with the precaution to “not lift any object heavier than a cat”. You must have a very large cat. Everywhere I have worked in my 24 year career as a hospital based Anesthesiologist in the Operating Room I’ve been required to perform all sorts of lifting, twisting, bending and maintaining awkward positions for a sustained period of time. Do you have a non-operating room job? How is our work consistent with osteoporotic precautions? I am so sorry you’ve had such a difficult experience. My fracture was a simple “pancake” fracture with disruption of the superior end plate, but the inferior end plate was uninjured. Prompt kyphoplasty restored much of the height, and moved the superior end plate back into a more normal orientation though there is still a little posterior displacement. As of this writing, not quite five weeks later, I am having very little discomfort except when I am in the same position for too long. I went back to work after two weeks, on active OR duty. We are fortunate enough to have ample staff. When it comes to turning patients lateral or supine, I do ask for someone else to lift the head while I watch the airway and lines. As far as moving patients from bed to gurney–we have good sliders, and I often work with residents, so that hasn’t been an issue. Bending and turning aren’t a problem, and neither is intubation since I’ve always been careful to position the patient at a good height and angle for me. So all I can say is that I was fortunate–both in the type of injury and in the prompt treatment. I’m very happy at being back at work! One thing I invested in was a good Tumi backpack–they make nice ones that are designed to function as briefcases, with a padded compartment for a laptop, etc. That’s better to carry than a heavy purse or briefcase. Best of luck for your continued recovery, and thank you for writing. What about estrogen therapy? And maybe even some testosterone therapy. btw, This is my first post ever on a blog. I feel so strongly about the benefits of estradiol therapy, in the form of brand Vivelle Dot patch, I had to respond to your story. Estrogen therapy may help prevent future fractures. I use Brand Vivelle Dot myself, for osteopenia. All the best to you during your recovery. Again, I think treatment choices are many, and should be decided by each individual in concert with your physician. As far as I am aware, estrogen therapy alone isn’t enough to stop postmenopausal bone loss, but of course it may have multiple other symptomatic benefits.